Customize your furnishings project using modular casework. Since 1981 SYSTEMATICS has set the standard of quality and value for modular casework components and custom casework throughout New England. We provide standard products, and custom solutions developed in consultation with our experienced design staff, reflect our focused design expertise. Our objective is always to create the precise solution that meets a project’s design and functional requirements. 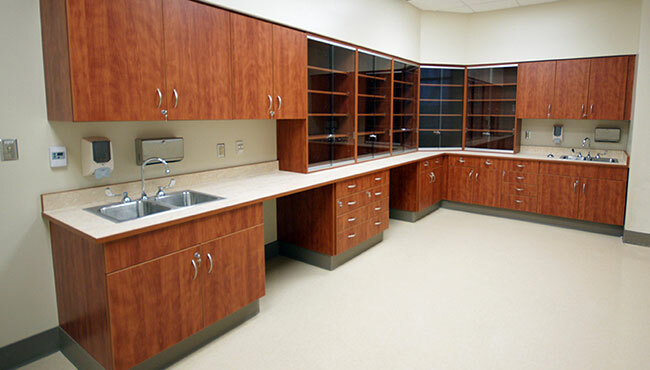 Modular casework is flexible, durable, and easy to specify. Request our Specification Guide to easily select a standard cabinet design and dimensions, or tell us your project specifications and our designers will work with you to create the exact solution that meets your requirements. Modular casework is reconfigurable and expandable. From storage lockers to bookcases and closets, modular casework has the look of expensive millwork, but is easily reconfigured and expanded. Our designers utilize computer generated design and manufacturing specifications to insure a perfect match for future orders. Modular casework gets you organized. Our adjustable shelf and organizing modules are easily integrated with our cabinet solutions to meet the specific storage and accessibility requirements of any activity. Adjustability on 1” increments easily facilitates expansion and contraction of shelf capacity, eliminating wasted space between shelves. Let us help you find your flexible modular casework solution. Call 800-229-8393 today! If you are ready to start planning your project, start with a free copy of the Modular Casework Specifier’s Guidebook. This Specifier’s Guide will help you start your project immediately. Design Consultants are available to assist you throughout your planning process. Our design team can help you preplan the design and installation of modular casework into a new construction or existing work space. Tell me more about Modular Casework. Call 800-229-8393 to get in touch with SYSTEMATICS now!